It takes lots of thought, hard work, and the development of a new mental construct of communication and behavior to understand Alzheimer's disease. It takes lots of thought, hard work, and the development of a new mental construct of communication and behavior to understand Alzheimer's disease. It takes time. Take the relationship between my mother and me as an example. I've known my mother my entire life. We have been communicating our entire lives. I would imagine that our communication is similar to most people. We engaged in all the human behaviors and emotions over the years. We established patterns of communication to deal with the good and the bad. Did I ever get angry with my mother -- of course. Frustrated, agitated -- of course. When we had a problem with each other we learned how to work it out. How to make up and reattach. Over the course of 50 years we developed our own method of communication -- our own behavior. Our communication and the way we related to each other changed - abruptly, over night. It was if our ability to communicate effectively had been robbed from us. I knew and understood these changes were being caused by Alzheimer's disease. On the other hand, my mother couldn't see the change. She couldn't understand what was happening. When my mother would say something mean, or act out crazy behavior, I experienced the same emotions I had my entire life. Anger, frustration, and agitation. Why wouldn't I? I felt the same exact feelings and emotions that I had been experiencing for 50 years. I had 50 years of practice. Looking in from the outside, most people would conclude its easy to come to an understanding that the meanness and craziness are a direct result of the disease -- Alzheimer's. They conclude you simply adjust and come to an understanding that Alzheimer's is the cause of the behavior, and as a result you can just shrug off the meanness and craziness. This is far from the truth and the reality of the situation. It is almost impossible to explain to someone how difficult this adjustment can be. How difficult? It took me years. Years while I was trying to do it day after day after day. Every day. I finally made the leap when I started to develop pictures of the behavior, and finally came to some simple conclusions. I had to change my mother couldn't. I had to find a way to get into Alzheimer's World, instead of trying to drag her back into Real World. She wasn't coming back. Never. Here is how our life looked before Alzheimer's. My mother had her life. I had my life. 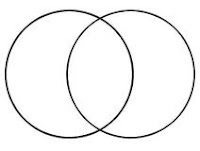 Our lives clearly intersected and we had all of our shared experiences stored in the intersection of the two circles. We had an understanding and frame of reference that we developed over our lives. We knew each other very well. We knew how to deal with each other. After Alzheimer's struck, this is what our life looked like. It was like we were two new and different people. I guess you could say, we had to get to know each other again. I thinks its obvious that when you first meet someone it takes time to get to know them. Over a long period of time you get to know and understand them -- better and better. In this particular case you have to get to know a person and deal with a person that is often mean, and often does things that make you angry. You really have two distinct choices. The first choice is easy -- walk away. Or, you can hand the problem to someone else. You have a second choice -- to learn how to love and care for someone that does things that normally would make you do what you would do in choice one -- walk away. You have to choose. You can choose change and understanding. Or, you can try what I call the hamster approach -- The Alzheimer's Hamster Within YOU. Run around the hamster wheel faster and faster, and get no where fast. If you choose the hamster approach you'll most likely end up bitter and angry, or worse -- depressed. You are the one that must decide. I finally came to the conclusion that before I could make the leap into this new world, I needed a construct of this new world. I was coming to an understanding of what I wanted to do and how I was going to do it. In order to organize my ideas I also decided I needed a picture of what this might look like. This is how I began to picture my new relationship with my mother. The yellow section is the intersection of my mother's world (red circle), and my world (green circle). I call this yellow intersection Alzheimer's World. In the Alzheimer's Reading Room, I write about my own efforts to understand, cope, and deal effectively with Alzheimer's. If you want to read about my own construct of Communication in Alzheimer's World -- Communicating in Alzheimer's World. I continue to develop articles on Alzheimer's World, and how over time I developed a plan to make the leap into Alzheimer's World. How I learned to get into Alzheimer's World, how I learned to function in Alzheimer's World; and how together, my mother and I learned to thrive in Alzheimer's World. I'll continue to write and elaborate about Alzheimer's World over time. Dotty and I learned how to live our life one day at a time. We coped and communicated with each other often in the intersection of our lives best described as -- Alzheimer's World.